The majority of Americans say they do not know a Muslim. For many of these Americans, what they know about Muslims comes from media representations. 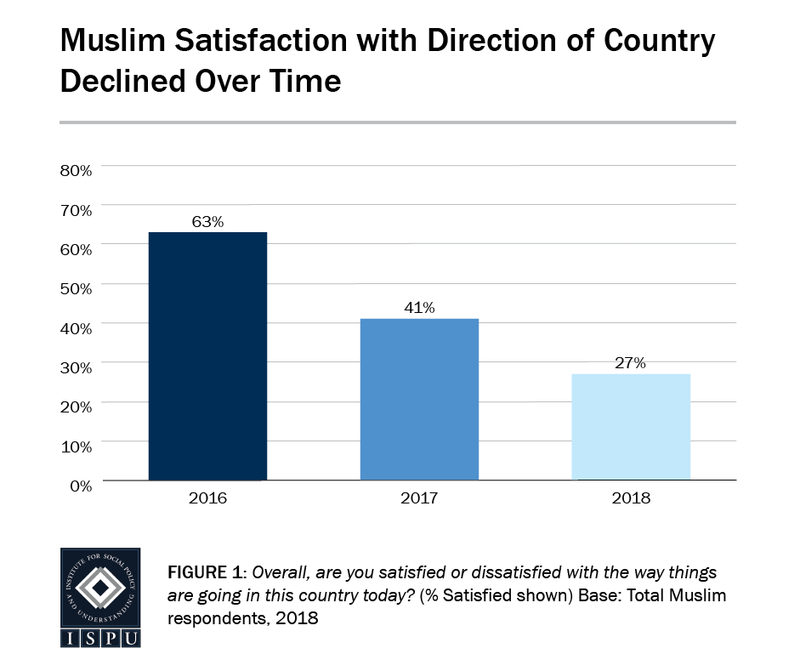 However, according to media content analysis, more than 80 percent of television media coverage of Islam and Muslims in the United States is negative. Such narrow media representations open the door to distorted public perceptions of American Muslims, especially in the absence of any first-hand knowledge of this diverse community. The role of the media in informing the public has never been more important, especially when it comes to marginalized communities. At the same time, journalists are constantly asked to cover more and more, with less resources. We created this guide to help. 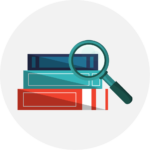 Note: ISPU intends this page to be a living document regularly updated with new research, graphs, guides, and additional resources. Why should journalists turn to ISPU? This short video will explain. 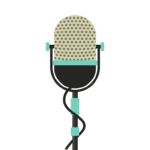 Expand the voices that inform your reporting. 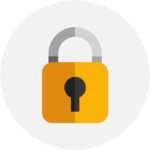 Move beyond the security lens. Cover stories about American Muslims not framed around national security or criminal violence. Shed light on the diverse roles American Muslims play in their communities, and provide a more accurate, nuanced portrait of who American Muslims really are. Treat Americans that are Muslims as just that—American. There has never been an America without Islam and Muslims; they were early explorers, enslaved Africans, and immigrants from around the world. Casting Islam and Muslims as foreign, non-American, and “other” is inaccurate. Rather, rightly cast Muslims as a part of the diverse fabric of American society. Avoid implicating religion as the sole explanation for negative behavior. Americans that are Muslim are complex human beings, and their motivation is complex. Don’t assume religion is the driver of their behavior. Be factual and avoid loaded or Orientalist language. 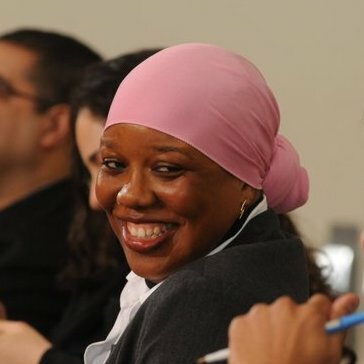 Precious Rasheeda Muhammad speaks about Black Muslims and their centuries-long ties to the making of America, reminding journalists of the plurality of Muslim communities. ✅ Does my media outlet feature the voices of Americans that are Muslim in contexts outside of violence and public safety? ✅ Is my media outlet including Muslim voices in stories about subjects that concern all Americans? ✅ Does my coverage of American Muslims feature reliable mainstream Muslim experts and sources? ✅ Am I being representative and including Black Muslim voices in my reporting on “Muslim stories”? ✅ Am I considering what factors other than religion and ethnicity might explain the behavior in question? Could trauma or economic factors be a more powerful variable than ethnicity or religion? ✅ Have I included the voices of American women who are Muslim in my reporting that represent the vast majority of women’s experiences (Islam-positive, educated, and more challenged by racism and Islamophobia than Muslim misogyny, according to ISPU’s American Muslim Poll 2018)? ✅ Am I using culturally neutral language? Arabic words or culturally specific language is often used to describe behaviors that are not unique to Muslims or Arabs, making the behavior seem pathological to these communities. Before using such language, it is helpful to ask yourself: Am I assigning foreign (“Muslim-sounding”) words to a universal human behavior? What would I call this type of behavior if it didn’t involve a Muslim person? ✅ Is my story driven by the priorities and points of view of the majority? If not, am I qualifying it as a minority point of view? 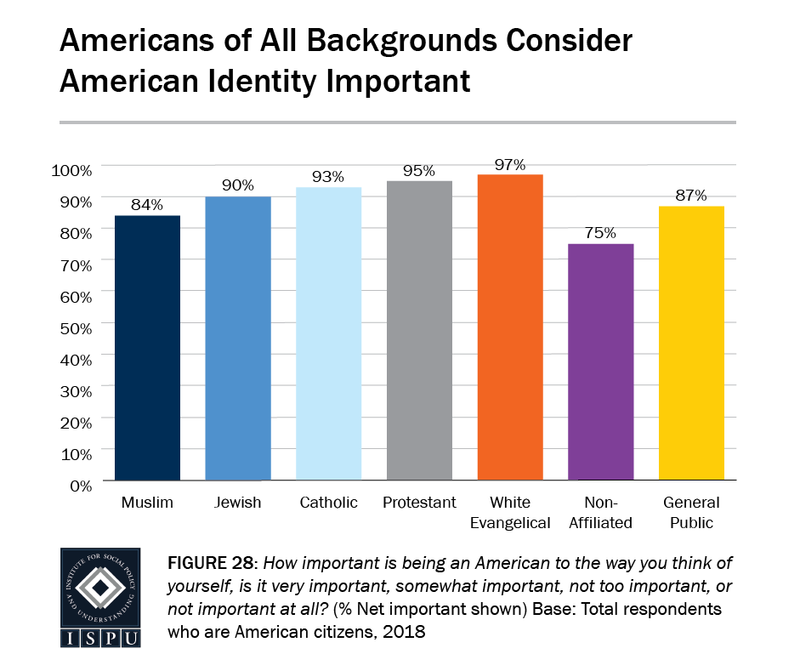 Despite empirical evidence to the contrary, many misconceptions and damaging stereotypes about American Muslims often are repeated in mainstream media and go unchallenged. 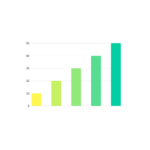 The following are data-driven responses to common misconceptions. 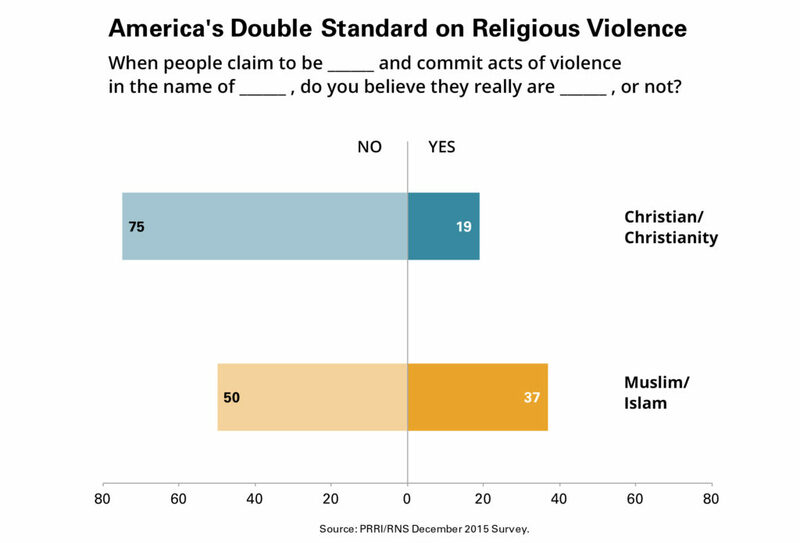 FACT: Muslims are one of the most likely groups in the United States to reject violence. 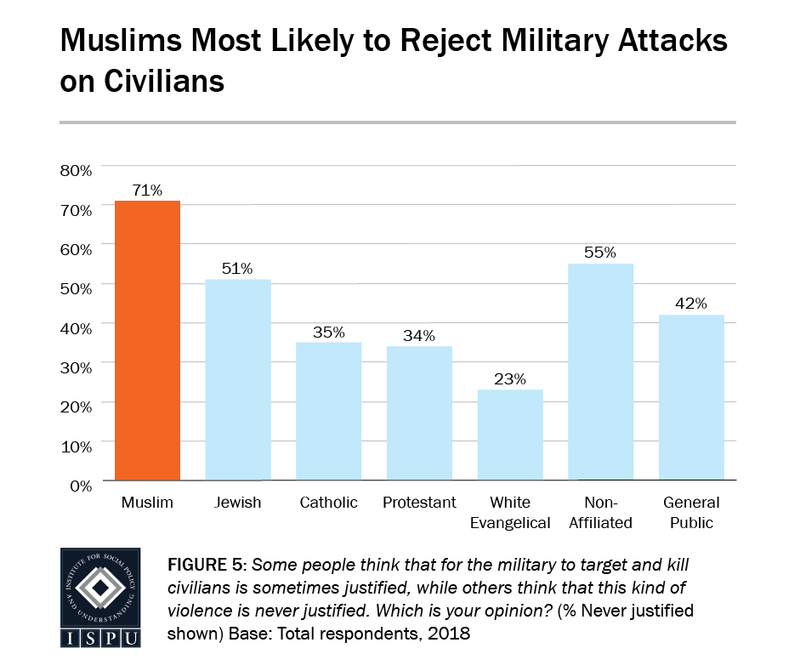 ISPU’s American Muslim Poll 2018 found that Muslims were the least likely to accept both military and individual violence against civilians. 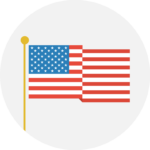 FACT: A strong Muslim identity is directly correlated with a strong American identity. Such data challenges the myth that Americanness and Muslimness are mutually exclusive. FACT: American Muslim leaders and organizations have consistently and repeatedly condemned violence and denounced violent ideologies. But should they be expected to? Or are such expectations based in bigotry and Islamophobia? 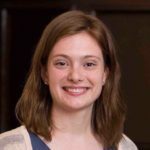 ISPU recently examined attitudes surrounding this debate. 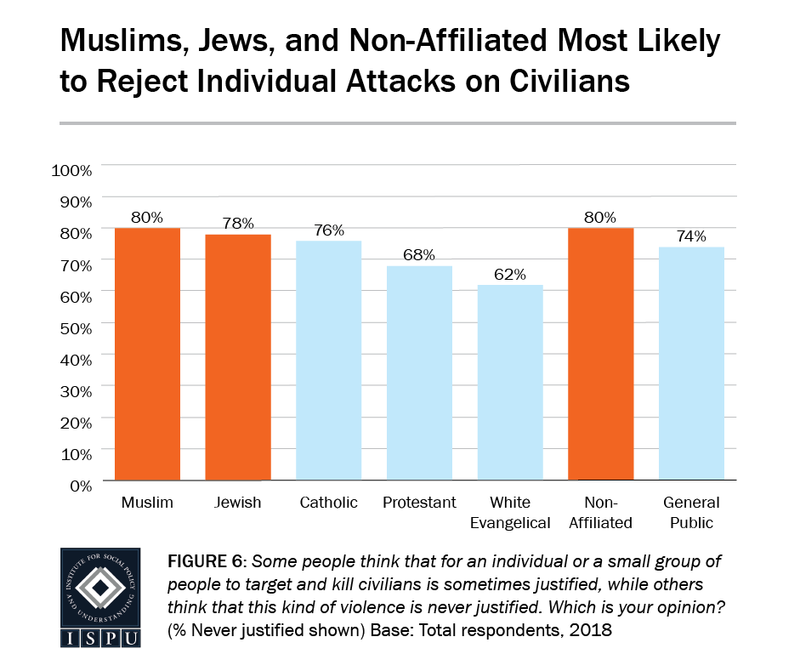 In ISPU’s 2017 American Muslim Poll, 50% of American Muslims and 44% of the general public responded that American Muslim leaders should condemn ideologically motivated violence publicly. 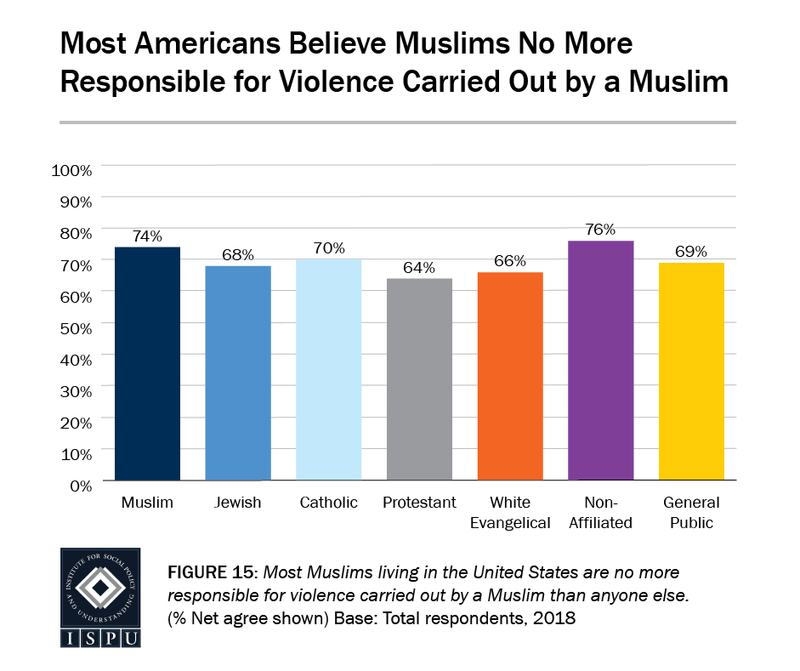 FACT: Most Americans agree that Muslims are no more responsible for violence carried out by a Muslim than anyone else. 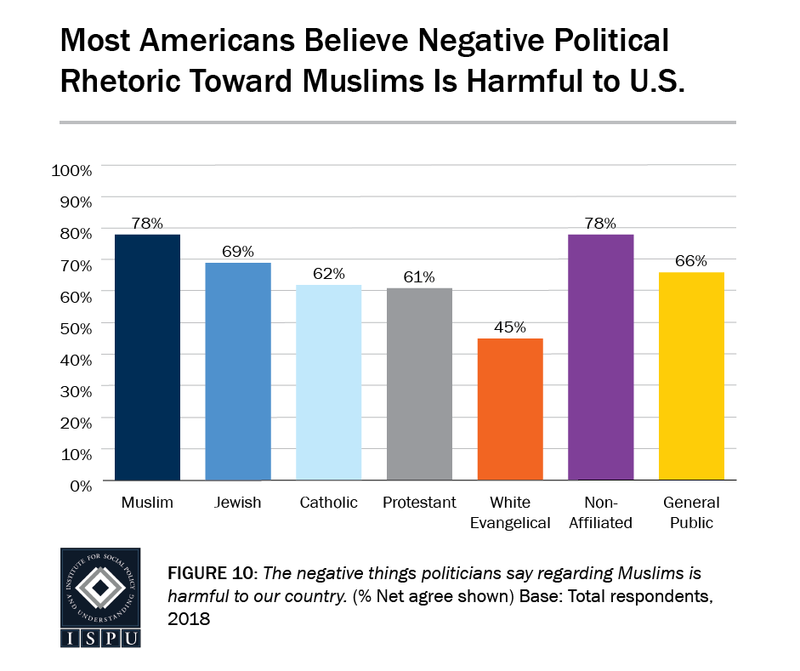 Most Americans also agree that negative political rhetoric toward Muslims is harmful to the United States. 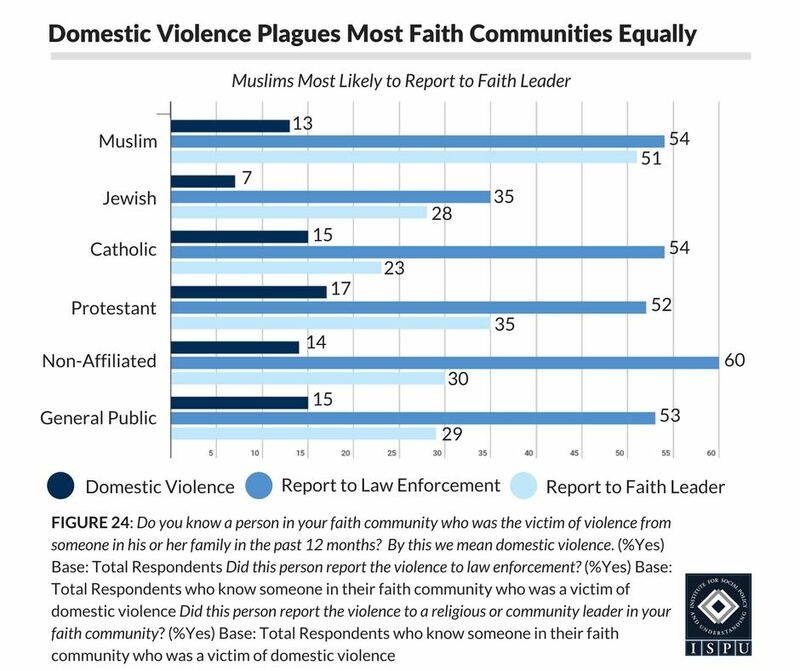 FACT: Violence by perpetrators perceived to be Muslim receives far more media attention than other types of ideologically motivated violence. A recent study by ISPU found that perceived Muslims accused of a violent plot received more than seven times the media attention as their non-Muslim counterparts, despite similarities in their alleged crimes. Similarly, Muslim-perceived perpetrators accused of violent acts were referenced in the media more than four times the rate of their non-Muslim counterparts. FACT: Muslims who bring up religious-based claims in court are not attempting to change the laws of the United States. 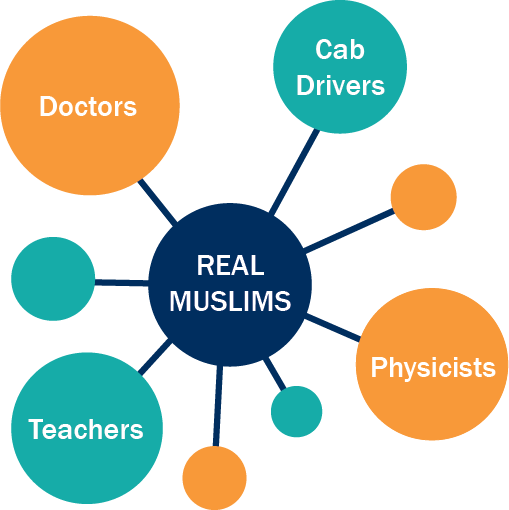 Individual Muslims determine the role of religious rules in their lives depending on their personal beliefs. If a legal dispute arises involving one of those rules, individuals will likely find themselves in litigation, raising claims before an American judge. Anti-shariah legislation restricts the rights of American Muslims to apply religious rules to their lives. This type of legislation is also strongly linked to other forms of bigotry and a legislative agenda aimed at excluding various minority communities from the political landscape. FACT: The concept of taqiyyah refers to a religious permission to conceal one’s faith if revealing it endangers one’s life, not an open license to lie. As explained by American Muslim scholars, nothing in Islam gives Muslims general permission to lie. The origin of the notion of taqiyyah refers to the permissibility for Muslims to conceal their faith if identifying as Muslims puts their lives in danger. FACT: By an overwhelming margin, Muslim women choose how they dress. 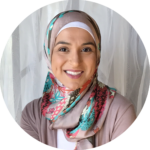 ISPU recently asked American Muslim women why they wear an identifying religious symbol like hijab. 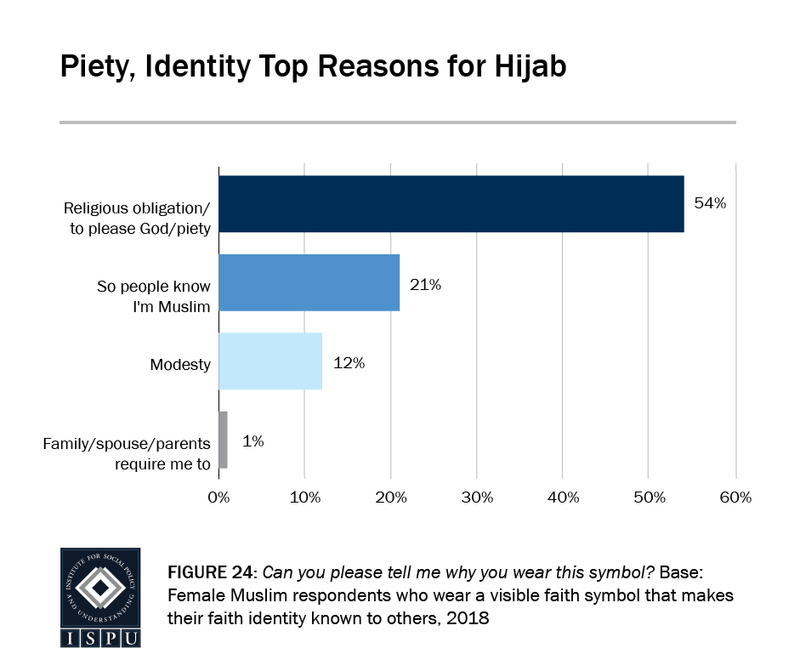 99 percent of respondents indicated personal reasons for wearing hijab, such as piety or the desire to be identified as a Muslim. FACT: The overwhelming majority of American women who are Muslim say Islam is a source of pride and happiness in their lives. American women who are Muslim are one of the most educated female religious groups in the United States. They also overwhelmingly view their faith as a source of happiness and a part of their identity for which they feel a great deal of pride. As described in a recent ISPU policy brief, the rights afforded to women by Islam in the seventh century include the right to a consensual marriage, to remain their own legal entities after marriage, to initiate a divorce, to child support, to own property, to pursue education, and to be involved in social and political affairs. Many Muslim women rise to the tops of their professions as doctors, lawyers, and scholars. A recent study suggests U.S. news media’s disproportionate focus on gender discrimination in Muslim societies contributes to stereotypes that Muslims are distinctly sexist and misogynistic. Muslims make up about one percent of the population in the United States and are the fastest growing and most diverse religious community in the nation. 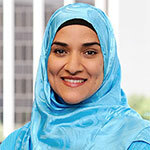 Dalia Mogahed conducts a brief overview of American Muslims. Who are they? Why does the media matter? And how can journalists replace fear with facts? 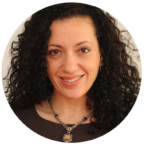 Learn even more from Dalia by watching her free Poynter webinar for journalists. ISPU’s Muslims for American Progress study quantifies the impact of Muslims on U.S. communities. 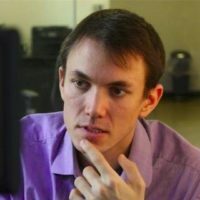 Who is speaking for the community? Are sources representative of the community’s diversity? The majority of both Sunnis and Shias share the core beliefs of Islam and adhere to the Five Pillars. The main differences between them today are their sources of knowledge and religious leadership. In addition to the Quran and hadiths, the Shias and the many sects that comprise them rely on the rulings of their Imams and resulting variations in beliefs and practices. Historically, the difference originated from the question of succession after the death of the Prophet Muhammad and is related to differing views about appropriate leadership for the Muslim community. The majority today are Twelve-Imam Shias (notably in Iran, Iraq, Lebanon, Saudi Arabia, Bahrain, India, and Pakistan); however, smaller sects include the Ismailis (in India, Pakistan, Syria, and Yemen ) and the Zaydis (in Yemen). These words have been politicized and misrepresented, and are often are used as slurs. According to a recent study, the word “terrorist” was used in media headlines far more often in reference to perpetrators perceived as Muslim than those who are not for similar ideologically motivated crimes. These are neutral, clear, informative alternatives to commonly misused words. When reporting on ideologically motivated violence, use fact-based language to describe groups, persons, and events at hand. For example, describe perpetrators as “militia,” “gunmen/women,” “bombers,” etc. According to the Merriam-Webster dictionary, this term refers specifically to “a popular reform movement advocating the reordering of government and society in accordance with laws prescribed by Islam.” The majority of these movements are nonviolent and shouldn’t be lumped together with those claiming Islam sanctions their violence. There is no causal relationship between religious adherence and violence. We’ve never lumped the Lord’s Resistance Army and the Ku Klux Klan together as “Christianist terrorists,” even though both claim to act in the name of Biblical teachings. Instead, we simply use the group name. Do the same for all groups. Literally, the word “jihad” means “struggle” and most often refers to the inner struggle against one’s own evil impulses, such as greed, anger, and malice. According to Muslim theologians, armed jihad is a heavily regulated military engagement where non-combatants, livestock, and even trees cannot be harmed. Individuals who commit ideologically motivated violence and claim their actions are sanctioned by Islam should not be referred to as engaging in “jihad,” nor should they be called “jihadis” or “jihadists.” Use fact-based language to describe groups and events. Use the same standards in all coverage of ideologically motivated violence in your newsroom. The group that refers to itself as “The Islamic State,” known also as ISIS/ISIL, has been denounced by nearly every major cleric of Islam as un-Islamic. 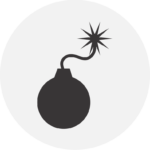 We recommend Daesh, which is the acronym of ISIL in Arabic, just as we say Hamas, which is the acronym for a longer Arabic name for the group. Current AP style guidance doesn’t use “The Base” for Al-Qaeda. Similarly, we shouldn’t translate other words. In all instances possible, use accurate, unloaded terms. The alternatives are ISIS/ISIL. American Muslims are often viewed through a security lens, cast as either good or bad from a purely security-oriented perspective. Stories about “bad Muslims,” who are violent or likely to act violently, and the rare “good Muslim” who is “rooting out extremism in his own community” dominate the American imagination about American Muslims. Americans of the Islamic faith are much more than this binary. They are doctors, cab drivers, school teachers, engineers, and physicists. Moving beyond the security lens to include such voices provides a more accurate portrayal of American Muslims. Relationships of trust between media professionals and individuals in the American Muslim communities produce better, richer reporting. The following tips, adapted from the Religion Communicators Council, help improve depth of coverage. ✅ Do work actively to form connections with local, national, and international Muslims to establish a relationship. ✅ Do attend a local, national, or community event. ✅ Do focus on interesting stories done by Americans who just happen to be Muslims. ✅ Do write on American Muslim stories that are not framed around ideologically motivated violence. ✅ Do find value in American Muslim experiences and contributions other than helping national security or countering violent crime. ✅ Do write more stories about the lives of American Muslim women not involving the hijab, burqa, domestic violence, or FGM. ❌ Don’t assume all hijab-wearing women (or bearded men) are religious Muslims. ❌ Don’t assume all uncovered women (or clean-shaven men) are not religious Muslims. ❌ Don’t wait for an event dealing with Muslims to develop sources. 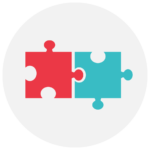 Develop a source list and make it available to colleagues. ❌ Don’t use the word “unveil” in your title. ❌ Don’t assume any person claiming to represent Muslim communities really does. ❌ Don’t use fringe Muslims as representatives for diverse Muslim communities. ❌ Don’t assume all Muslims can speak accurately about Islam. Kumar Rao and Carey Shenkman explain how the media covers ideologically motivated violence differently when the perpetrator is perceived to be Muslim versus not perceived to be Muslim. Perceived Muslims receive four times the average prison sentence. Undercover law enforcement provided the means of the crime (such as a firearm or inert bomb) in a majority (two-thirds) of convictions involving a perceived Muslim perpetrator, but in a small fraction (2 out of 12) of those involving a non-Muslim. Covering crime and violence in all its forms is a challenge many journalists face. The following recommendations, based on the Asian American Journalists Association reading of ISPU’s Equal Treatment? 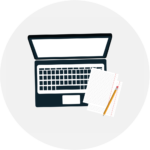 report, help inform journalists’ reporting on ideologically motivated violence. Many experts agree that white supremacists and right-wing extremists pose a more serious threat to Americans than individuals who falsely claim Islam sanctions their crimes. Rather than paint them as “lone wolves,” coverage of these extremists should include the context of this growing national threat. Law enforcement rarely discuss the documented role of informants and agent provocateurs in motivating and operationalizing terror plots that would have never manifested without the law enforcement asset. Journalists need to ask law enforcement about their active involvement in these plots, or lack of, and mention it in all coverage. Every newsroom needs to have a discussion on whether and when to use the terms “terror/terrorism/terrorist.” The word “terrorism” is highly politicized and many governmental agencies have their own various definitions. We recommend moving away from the word “terrorism” and using instead “ideologically motivated violence,” which is a neutral term. The standards should be the same regardless of the suspect’s background or views. Use actual, concrete terms to describe what has happened, not buzzwords that will inflame. 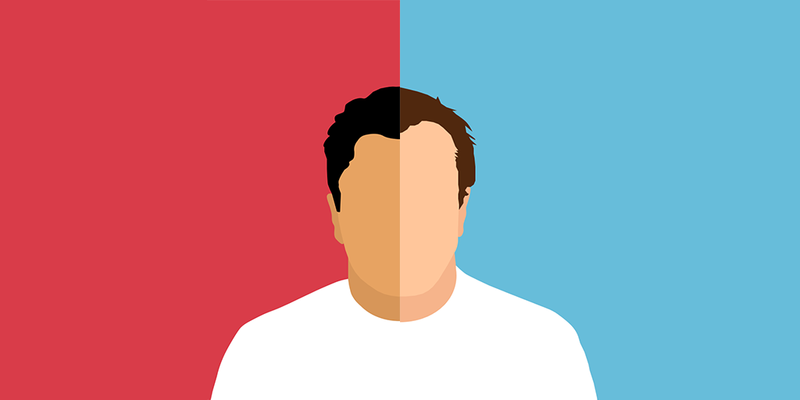 Newsrooms should discuss when a suspect/offender’s race, ethnicity, religion, or national origin are relevant. Using descriptors of race, ethnicity, religion, or national origin when they’re not relevant or without explaining their relevance can perpetuate harmful stereotypes. Such stereotypes prevent discussions on how mental illness and other systemic problems can lead to violent attacks or plots. Journalists covering ideologically motivated violence must question prosecutors and investigators over why they are or are not calling something terrorism, why they’ve chosen to charge a suspect with particular crimes, and what evidence they have for their charges. ISPU’s report found the Justice Department sent out six times more press releases for offenders perceived as Muslim than offenders who were not, and ideology was highlighted more often in the former than in the latter. 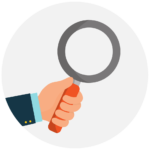 Journalists need to read between the lines, ask questions about language used and facts omitted, and verify details. Journalists should examine what they’re covering, what they’re not covering, and ask newsroom decision-makers why. 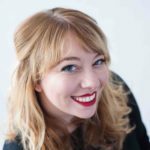 Some basic rules should apply: Does the reporting give background and context? Does it offer diverse voices? 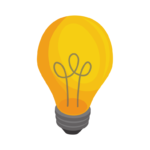 Does it follow up on events or situations to gain greater insights as well as measures of change or impact? In an Islamic context, the word shariah refers to the set of principles mandated by God through the Quran and Prophetic example. There is no one way to interpret and apply these principles. A rigorous legal process allows shariah to be interpreted in varying (and often contradictory/debated) ways in different times and contexts. Specific rulings that dictate Muslims’ lives are the result of this interpretation of shariah by Islamic jurists. This process, called ijtihad, produces rules called fiqh. 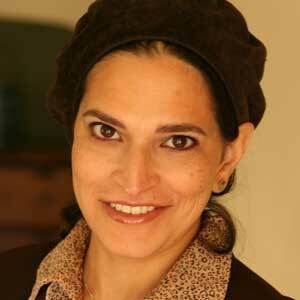 According to Dr. Asifa Quraishi-Landes, translating shariah as “Islamic law” is problematic because in the United States, we think of law as derived and enforced by the state. However, religious law, like Jewish halakha or Islamic shariah, are often complete systems of doctrine that do not require state power to govern individual behavior. Fiqh rules cover a range of arenas, from religious rituals like prayer and fasting, to business transactions. Fiqh is pluralistic and is understood to be the unavoidably fallible, human articulation of shariah. Unfortunately, in some predominantly Muslim countries, one fiqh interpretation is codified into law and called “shariah.” This undermines the pluralism that is meant to exist among various schools of fiqh. Dr. Asifa Quraishi-Landes conducts a brief overview of shariah. What is it? How is it related to secular law? How does it affect the lives of Muslims around the world? American Muslims’ request that the law recognize their choice to apply religious rules to their lives is not a demand that such rules be legislated for everyone. Muslims who bring up religious-based claims in American courtrooms are not attempting to change the prevailing secular law or force anyone else to follow shariah. 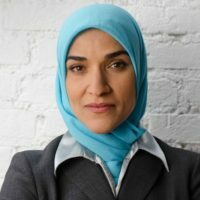 Legal disputes involving the application of religious rules to the life of an American Muslim should be subject to the same constitutional scrutiny as any other contract. Judicial respect for shariah-based practices exemplifies how Americans value religious freedom and religious pluralism without discriminating between religions. So-called anti-shariah legislation restricts Muslims’ constitutional rights and religious freedoms by limiting the practice of their faith in personal legal matters. An aggressive anti-Muslim campaign has posited that shariah is “creeping” into American law and is a threat to American democracy. However, such claims from anti-Muslim activists and pseudo-experts sorely miss the mark. Moreover, though anti-Muslim legislation may be motivated by Islamophobia, there is evidence that these laws are strongly linked to other forms of bigotry and a legislative agenda aimed at excluding various minority communities from the political landscape. Data from over 3100 bills across all 50 U.S. states showed that anti-Muslim legislation and anti-Muslim bigotry frequently overlapped with prejudices directed toward other communities. 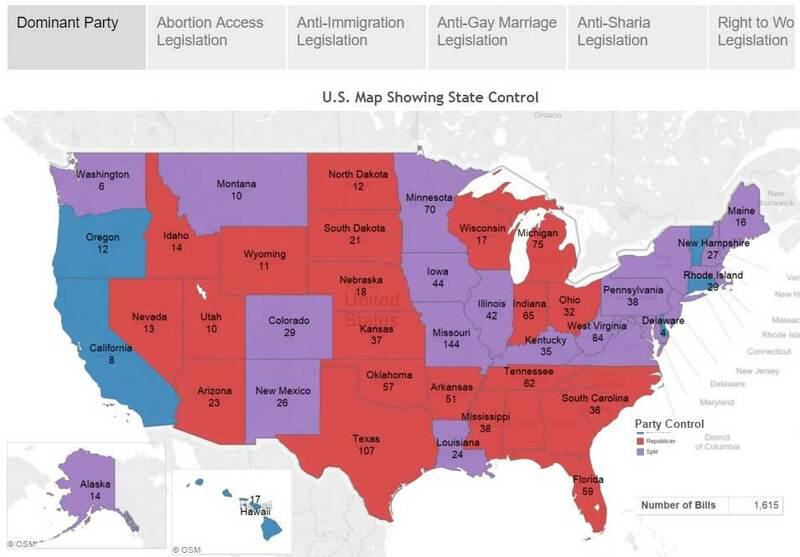 ISPU’s Islamophobia 2050 Restrictive Measures Map shows that (1) lawmakers that target Muslims also often support laws that disproportionately harm other marginalized communities and (2) such laws adversely affect communities of color, and others according to their national origin/ethnicity, civic association, gender, or sexual identity. American media has increasingly expanded its coverage of Muslim women, both in the United States and abroad. Yet, representations of Muslim women often falsely stereotype them as meek, powerless, oppressed, or, after 9/11, as sympathetic to crime and violence or only relevant in the context of their headscarf. Such stereotypes not only contribute to negative perceptions of Muslim women in the U.S. but also fly in the face of actual data showing that American Muslim women overwhelmingly see their faith as an asset in their lives. So, too, reporting often falls short of explaining the diversity of Muslim women, both those born in America and others from dozens of countries. 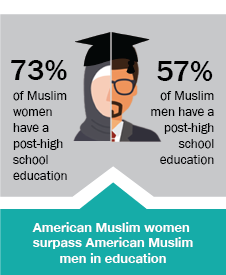 ISPU’s data helps paint a more accurate, nuanced portrait of American Muslim women. 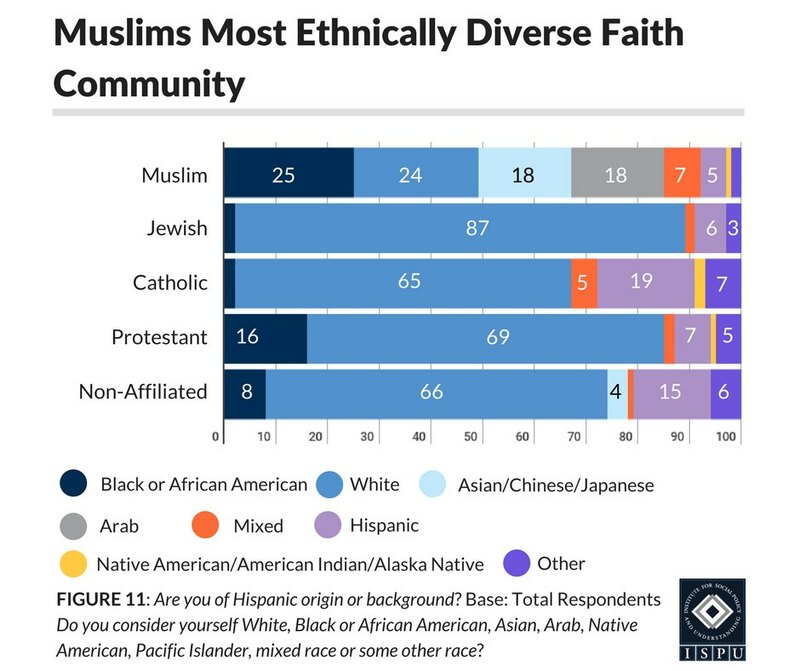 In the United States, Muslim women are more diverse than women of other faiths and are from the only faith group with no majority race. American Muslim women are more likely to report higher socio-economic and educational status than their male counterparts. 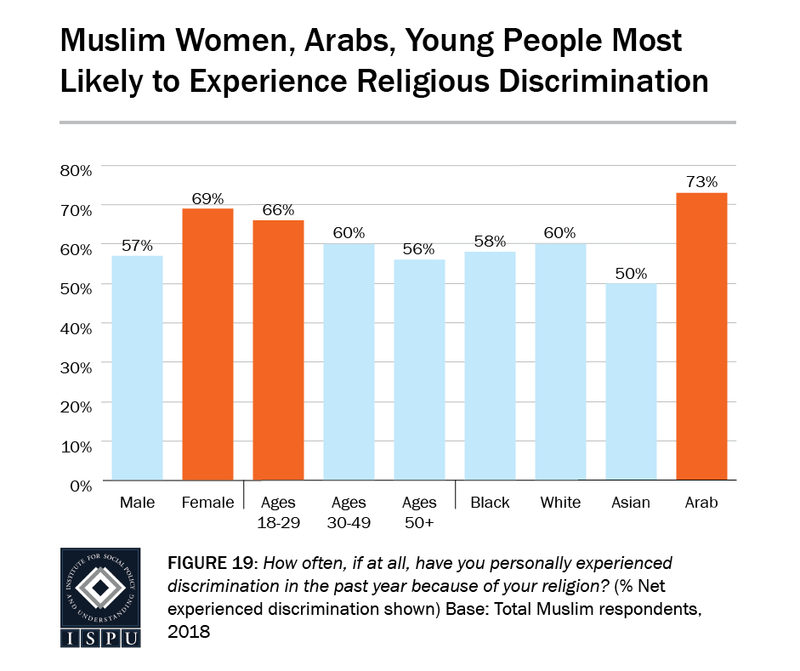 American Muslim women are also more likely than their male counterparts to say they experience discrimination and fear for their personal safety. Despite this, women are no more likely than men to alter their appearance to be less identifiably Muslim and have responded to the challenges they face with resilience and resistance. 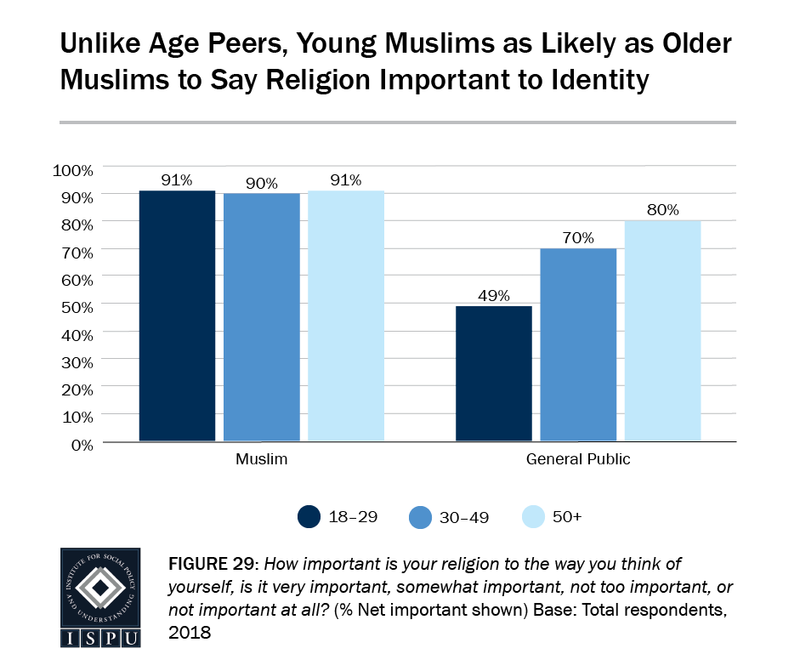 Additionally, American Muslim women value their religion as much as, if not more, than Muslim men, and are as active as men in their faith communities. Lastly, by an overwhelming margin, Muslim women choose how they should dress. U.S. news media’s tendency to frame coverage of women in Muslim societies around gender discrimination holds even after controlling for the actual conditions of women in those societies. Thus, countries with relatively good records of women’s rights are still more likely to be covered in relation to issues of gender inequality. The study concludes that slanted media coverage may be to blame for negative public opinion about Muslim women in the United States. ISPU knows that media matters, and we are committed to helping journalists and media professionals do their best work. Pulitzer Prize finalist, a former foreign correspondent, author and university instructor. He helped write and create “Islam for Journalists and Everyone Else.” He has trained journalists in Africa, the Arab world and South Asia. Aaronson, Trevor. The Terror Factory: Inside the FBI’s Manufactured War on Terrorism. Brooklyn, NY: Ig Publishing, 2013. Abdelkader, Engy. “Using the Legacy of Muslim Women Leaders to Empower.” Institute for Social Policy and Understanding, August 12, 2017. Ali, Wajahat. “Top 30 Dos and Don’ts When Covering Islam and Muslims.” Religion Communicators Council. Accessed August 2018. Ali, Yaser. “Shariah and Citizenship: How Islamophobia Is Creating a Second-Class Citizenry in America.” California Law Review 100, no. 4 (2012). Aziz, Sahar. The Muslim “Veil” Post-9/11: Rethinking Women’s Rights and Leadership. Institute for Social Policy and Understanding, 2012. Bleich, Erik, and A. Maurits van der Veen. “Newspaper Coverage of Muslims Is Negative. And It’s Not Because of Terrorism.” Washington Post, December 20, 2018. Chouhoud, Youssef. 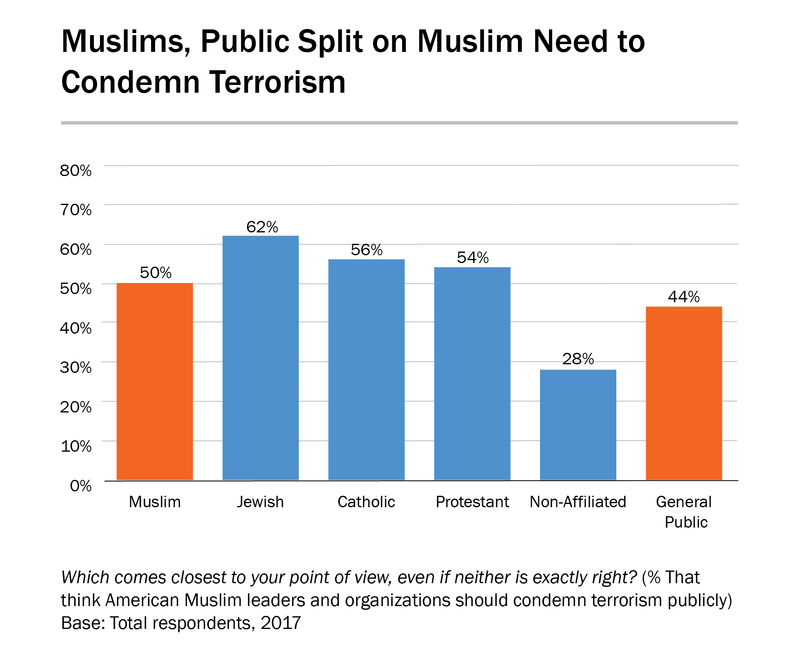 “Who Thinks Muslim Leaders Should Condemn Terrorism?.” Institute for Social Policy and Understanding, January 24, 2018. 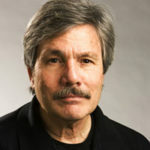 Corman, Steven R. “Why Some Some Islamists Are Violent and Others Aren’t.” Center for Strategic Communication, Arizona State University, May 25, 2010. Esposito, John L., ed. The Oxford Dictionary of Islam. Oxford Islamic Studies Online, 2018. Federal Bureau of Investigation (FBI). “What We Investigate: Terrorism.” Accessed August 2018. Hauslohner, Abigail, Joel Achenbach, and Ellen Nakashima. “Investigators Said They Killed for ISIS. But Were They Different from ‘regular’ Mass Killers?.” Washington Post, September 23, 2016. History Detectives. “Islam in America.” PBS. Accessed August 16, 2018. Ibrahim, Noor. “Sheltering Muslim Domestic Violence Survivors.” The American Prospect, February 9, 2018. Institute for Social Policy and Understanding, “Islamophobia 2050 Restrictive Measures Map,” 2018. 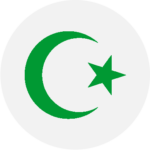 Islamic Networks Group. 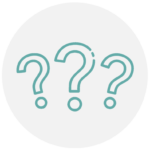 “Answers to Frequently Asked Questions about Muslims.” Accessed August 2018. Karam, Rebecca. 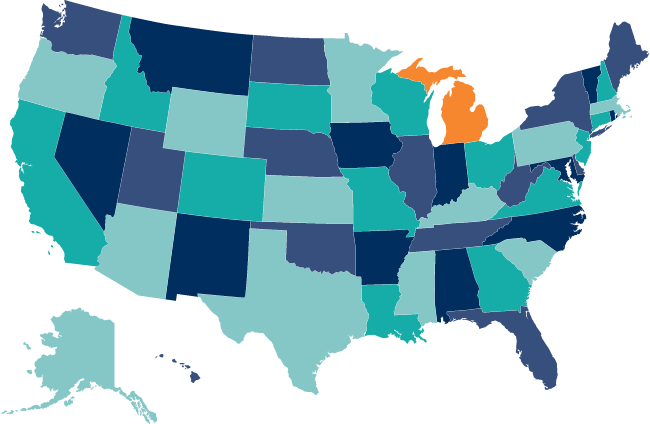 An Impact Report of Muslim Contributions to Michigan. Institute for Social Policy and Understanding, 2017. Khan, Saeed, and Alejandro Beutel. Manufacturing Bigotry: A State-by-State Legislative Effort to Pushback Against 2050 by Targeting Muslims and Other Minorities. Institute for Social Policy and Understanding, 2014. Lagasse, Paul, and Columbia University. The Columbia Encyclopedia. 8th ed. Columbia University Press, 2018. Lari, Waliya. “Seven Ways to Avoid Double Standard Reporting on Extremist Violence.” Asian American Journalists Association, 2018. Lipka, Michael. 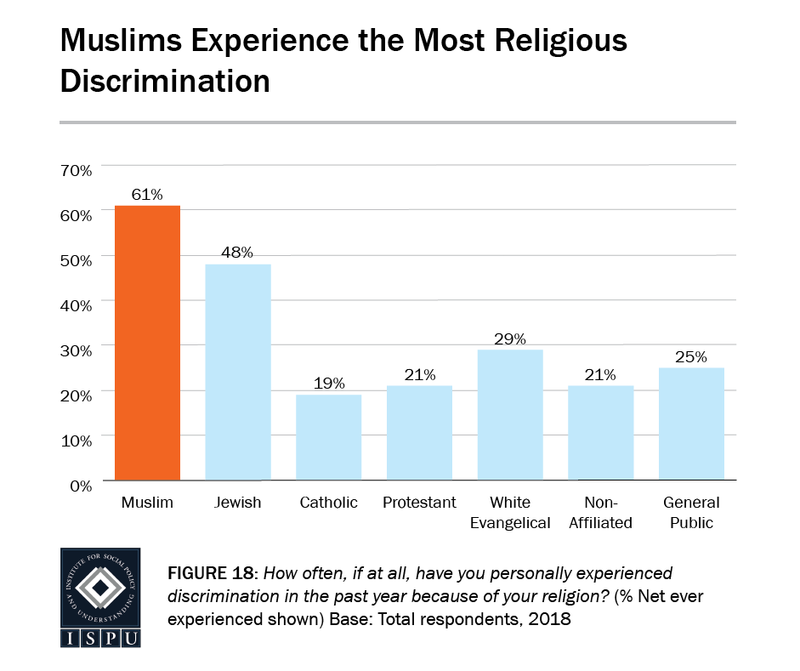 “How Many People of Different Faiths Do You Know?.” Pew Research Center, July 17, 2014. Marthoz, Jean-Paul. Terrorism and the Media: A Handbook for Journalists. United Nations Educational, Scientific and Cultural Organization, 2017. Media Tenor. “U.S. TV Primetime News Prefers Stereotypes: Muslims Framed Mostly as Criminals.” November 21, 2013. Mogahed, Dalia, and Youssef Chouhoud. American Muslim Poll 2017: Muslims at the Crossroads. Institute for Social Policy and Understanding, 2017. Mohamed, Besheer. “A New Estimate Shows U.S. Muslim Population Continues to Grow.” Pew Research Center, January 3, 2018. Muslim Public Affairs Council. 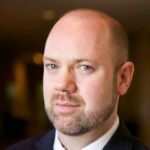 Not Qualified: Exposing the Deception Behind America’s Top 25 Pseudo Experts on Islam. Washington, DC: Muslim Public Affairs Council, 2013. Parrott, Justin. Jihad as Defense: Just-war Theory in the Quran and Sunnah. Yaqeen Institute for Islamic Research, 2016. Pew Research Center. “The World’s Muslims: Religion, Politics, Society.” April 30, 2013. Quraishi-Landes, Asifa. “How Anti-Shariah Marches Mistake Muslim Concepts of State and Religious Law.” Religion News Service, June 8, 2017. Quraishi-Landes, Asifa. Secular Is Not Always Better: A Closer Look at Some Women Empowering Features of Islamic Law. Institute for Social Policy and Understanding, 2013. Quraishi-Landes, Asifa. Shariah and Diversity: Why Some Americans are Missing the Point. Institute for Social Policy and Understanding, 2013. Quraishi-Landes, Asifa. Understanding Sharia in an American Context. Institute for Social Policy and Understanding, 2011. 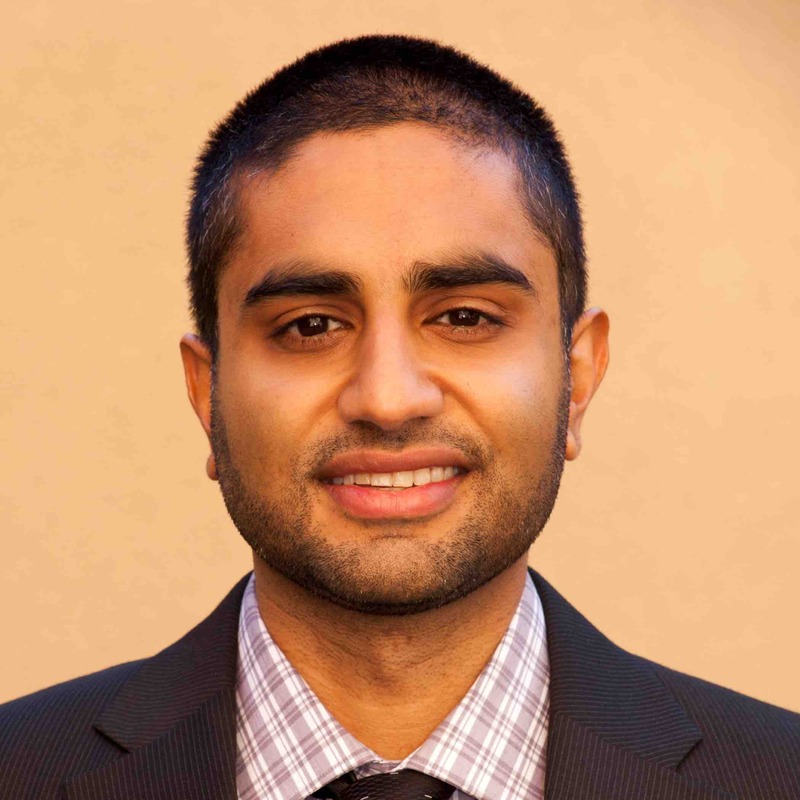 Rao, Kumar, and Carey Shenkman, Equal Treatment? Measuring the Media and Legal Responses to Ideologically Motivated Violence in the United States. Institute for Social Policy and Understanding, 2018. Shane, Scott. “Homegrown Extremists Tied to Deadlier Toll Than Jihadists in U.S. Since 9/11.” New York Times, June 24, 2015. Suleiman, Imam Omar, and Dr. Nazir Khan. Playing the Taqiyya Card: Evading Intelligent Debate by Calling All Muslims Liars. Yaqeen Institute for Islamic Research, 2017. Terman, Rochelle E. “Islamophobia and Media Portrayals of Muslim Women: A Computational Text Analysis of U.S. News Coverage.” International Studies Quarterly. Accessed August 16, 2018. Terman, Rochelle. “The News Media Offer Slanted Coverage of Muslim Countries’ Treatment of Women.” Washington Post, May 5, 2017. Younis, Mohamed. “Muslim Americans Exemplify Diveristy, Potential.” Gallup, March 2, 2009.